Nashville, TN is a rich center of culture, business, and art in the South. Often called the Athens of the South, it continues to draw individuals from all over the country… and even abroad! According to the most recently-released statistics, as many as 80 people are moving into Nashville a day, and within a few years, the city is expected to have grown by another million residents! So if you’re looking for Nashville real estate or want to browse local homes for sale, that means there’s a lot of competition. Unlike some websites like Trulia and Zillow, this website gets its home listings feed directly from the Middle Tennessee MLS, meaning we show you homes much faster– our data is updated every 15 minutes or less, letting individuals searching for homes find homes as soon as they hit the market, and not days or weeks later! One of the primary draws of Nashville is its collection of amazing, unique, and lively neighborhoods, each of which have their own unique personalities and lifestyles. Many Nashville neighborhoods are centralized around specific thoroughfares so that even in the heart of the city, you can feel ‘small-town’! 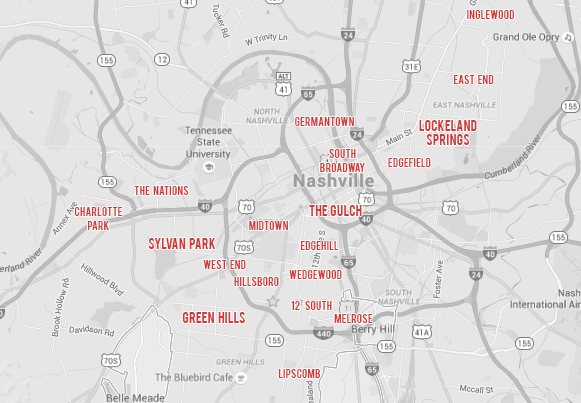 Great neighborhoods like Sylvan Park, Hillsboro Village, and 12 South are known for their close, small-town feel. But if you love big-city, urban living? The downtown neighborhoods of the Gulch, South Broadway, Germantown, and Midtown offer high-rises, downtown views, and fantastic nightlife and entertainment options. But no matter what neighborhood you’re looking to live in, we can help you!